Vice-President Yemi Osinbajo will be in Yola, Adamawa State on Tuesday for the Launch of the North-East Humanitarian Innovation Hub. stating that the Vice President, Yemi Osinbajo, will launch the North East Humanitarian Hub in Yola tomorrow, June 5, 2018. The Humanitarian Hub or North-East Hub is an all-in-one Centre for innovators to leverage on human resource strength and capitalize on several opportunities for the development of the North East. The Hub aims at ensuring sustainable peace and stimulating socio-economic growth in the region by providing key innovative support and access to basic human development activities. The Hub will connect affected people with innovators, social entrepreneurs, investors, technologists, tech companies and venture capitalists for immediate solution to humanitarian challenges. The hub commenced this with the North-East Makeathon which commenced in October, 2017. The North East Makeathon is a creative programme initiated to crowd source and support outstanding innovative ideas that can be used to fast-track the rebuilding process of the North East region. The Humanitarian Innovation programme streamlines all generated ideas into scalable solutions that could decimate the humanitarian challenges faced by IDPs and other affected persons in North East, Nigeria. 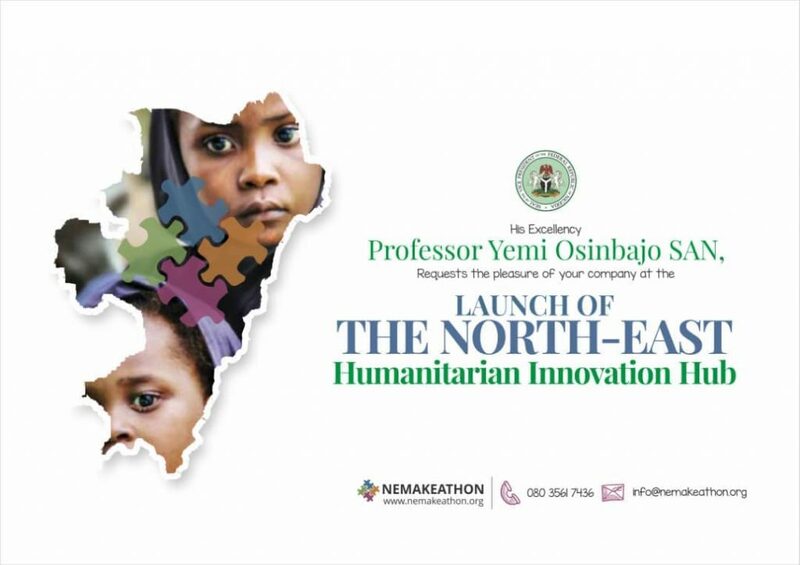 The NEMakeathon provides networking opportunities, peer review, pitch development, product development and testing to young innovators as they compete to find reliable solutions to humanitarian challenges in the region. The North East Makeathon is an intensive all-inclusive programme that includes the Pitch, Training, Mentorship and Incubation sessions for innovators working assiduously to use their innovative ideas to address identified priority challenges in the North East. At the end of this stage, outstanding teams with the best innovative ideas proceed to the Innovation Hub, where they will be stationed and operationalize their innovative ideas. Collaboration and coordination like these that would take place in the Hub would improve the socio-economic conditions in the North East, now and beyond. Eminently, the Hub will be recognized for bringing together the best minds and for proffering innovative solutions to challenges faced by the people of North East Nigeria.